I’m currently video blogging this from a wifi cafe in Oaxaca, Mexico. I just started a 14 month travel and work trip around the world. We live in an amazing time. With the power of the internet you and I can work from anywhere in the world. It’s an amazing feeling to wake up everyday and work on something you’re passionate about while traveling the world and having fun at the same time. We’re doing it here at Follow and I sincerely hope that you too can experience it someday too. So with that being said, here is the first, of many future video posts we’ll be doing from around the world. We’ve completed some great improvements to Follow and I’d like to share them with you now. 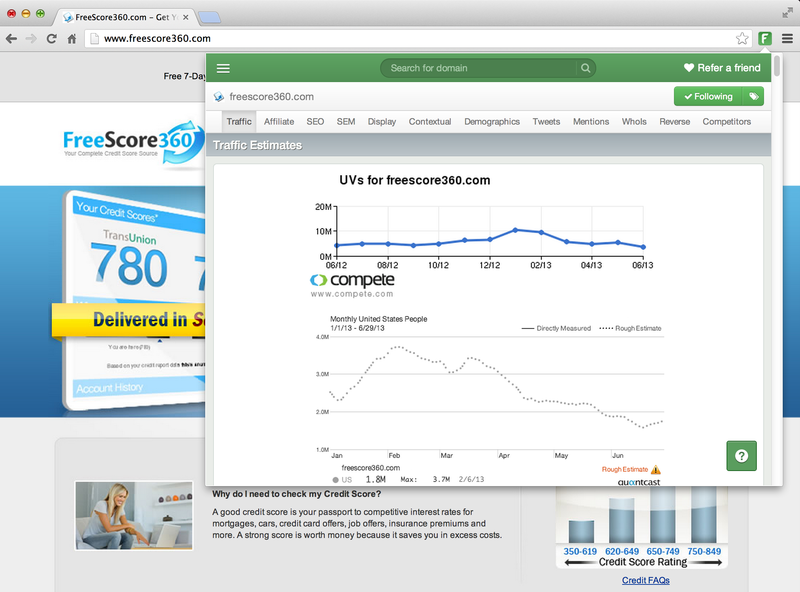 You’ll now be able to see a site’s contextual advertising activity. We’ve integrated with BoxOfAds to provide you with this data. 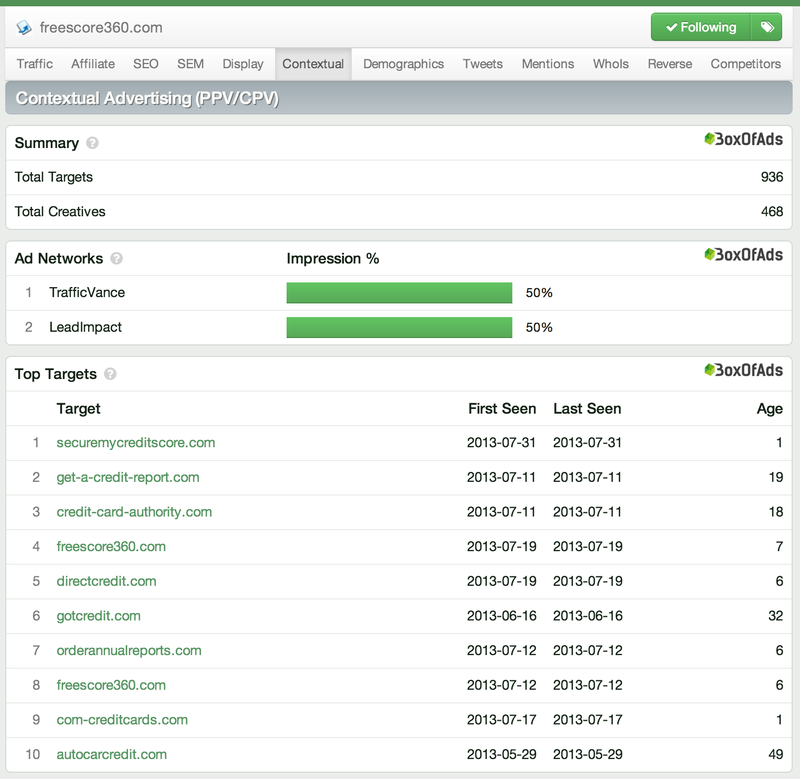 You’ll be able to see the top contextual ad networks a site is using, how many targets & creatives are being actively used, and what some of their top contextual targets are. What is contextual advertising? For those who don’t know, contextual ads are generally delivered in the form of a pop-up or interstitial ad when you’re viewing a website. For instance, sometimes you’ll visit a website an notice a large ad appear in the middle of the page, you’ll have to “skip” or “close” the ad to continue to where you left off. This is a type of contextual ad. Contextual advertising is also sometimes referred to as; Pay Pay View (PPV), Cost Per View (CPV), Pop-Ups and interstitial ads. To learn more about contextual advertising, watch our help videos or read the wikipedia article on contextual advertising. Every-time a site is mentioned on the web you’ll know about it! Once you follow a domain, moving forward, we’ll show you every-time someone talks about the site anywhere on the web. 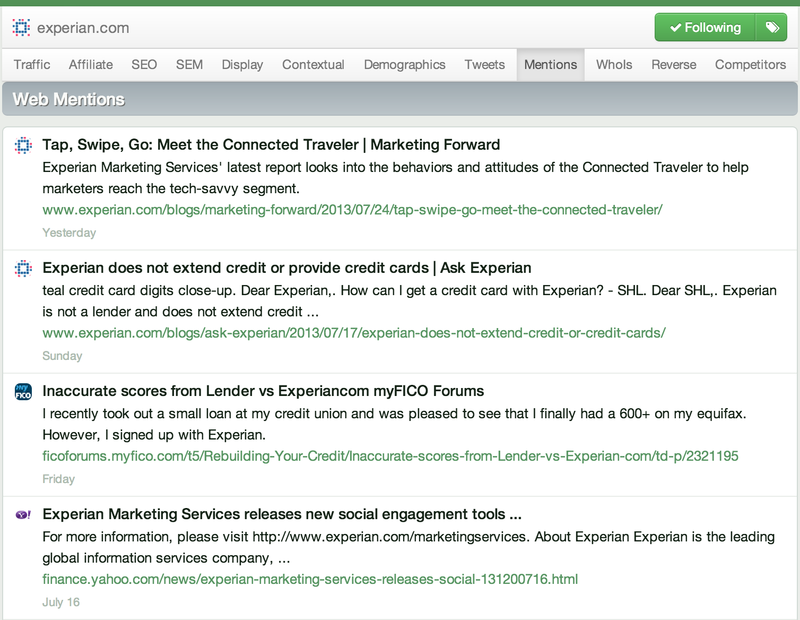 This is a great way to see who’s talking about a site. This is helpful to see every site whose ever mentioned your competitor or your own brand online. You can now see how visitors arrive to any website with the new SimilarWeb’s traffic sources graph we’ve added. This chart shows the percentage of users who visit a site from directly typing in the domain name versus those who clicked on a inbound link, clicked on a search result, came from social media, email or an advertisement. Basically, this is a easy way to understand how a website receives most of their traffic. Do they focus on social media marketing? Do they focus primary on paid advertising? Maybe they focus mostly on search or email? This new chart will tell you. 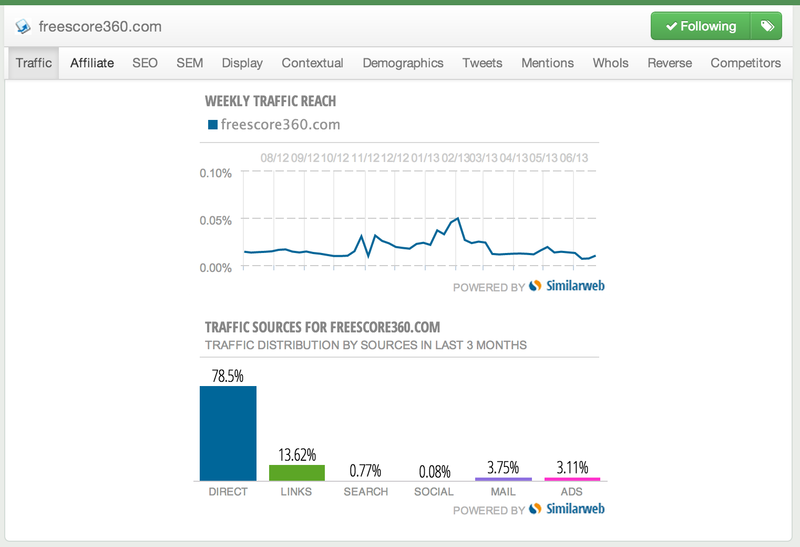 We’ve also added in SimilarWeb’s traffic reach chart. This chart is similar to Alexa’s daily reach chart, both charts basically show you what percentage of the internet users visits a website. We got rid of the big sidebar we had and switched over to the native Chrome extension pop-up window. We had issues before with the previous sidebar. Although the old sidebar we feel was a better experience when it worked, it just didn’t open all of the time and it was causing people issues. The old sidebar relied on injecting HTML into the pages DOM. This was a problem though because sometimes the page had to finish load, or just didn’t load properly at all and prevented our sidebar from working. So although the new extension is not quite as cool as our old sidebar, we’re happy to say it’ll open 100% of the time now without fail. We believe that’s the most important part, software should just work. We’d rather not have a product at all then a buggy product. PS: These new features are live now, check them out by logging into Follow now! This entry was posted in Uncategorized on July 31, 2013 by Wes Mahler. Very very useful service Wes! This cuts out market research time big time! Just brilliant..